It&apos;s easy to create an email message in your Relevant Tools account to be used with an email campaign and there are many different methods to choose from; each method having its advantages. One of the easiest methods to create a message is to create the message in your own email application and email it to Relevant Tools. To begin this process, click on MESSAGES, at the top of the screen. The Create a Message screen, the screen shown below, will be displayed. 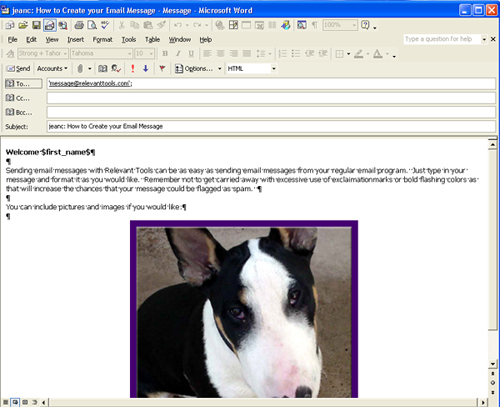 On this screen, click on the "Email–in" submenu option, at the top of the screen. Now, using your email application compose your email message in the usual manner and email the completed message to Relevant Tools. Recognize that while composing your message you can format the message as you normally would and can even attach a SMALL file or picture, as part of your message. Once the message is composed it should be sent to the email address specified in the Emailing in a Message – Simple Guidelines web page mentioned above; this email address will vary depending on the location of your account. However, the subject must be the userid you use to log into your Relevant Tools account followed by a colon followed by the actual subject of the message. Note: Once the message has been received by Relevent Tools, the subject of the message serves as the message name in the Messages area of Relevant Tools. After you send the message to Relevant Tools you will receive an email message letting you know the message has been installed. Note: If there is a problem with the message installation, Relevant Tools will send an email message and the first word in the subject will be ERROR: followed by the original subject of the message. This email message should contain a resolution to the problem with your message. Once a message has been installed in your Relevant Tools account you can edit your message and change who the email message is from so it&apos;s not from your personal email address but rather from a company email address. Furthermore, you can edit the subject or change the name of the message or even change the Reply To email address, if you would wish. The actual message is typically a MIME message that is composed of multiple parts - text, html, and any associated images or files. The nice thing is that you did not have to worry about these different parts. If you want to change the actual content of the message you can to go back to your email program, make the changes and resend it to Relevant Tools again as editing the generated html message can be tricky. In the last part of your message are any associated images or files. They have been encoded so that they can be transmitted over the internet. Don&apos;t change this part of the message at all in the edit screen. If you need to make changes go back to your email application. Test your message and when you are happy with the results you are ready to start your email campaign and send it out to your database.